I took this photo in his old office in the Engineering Laboratory across from the Union on the OU main campus. This was in 1973, but he looked very much the same right up to the time of his death. Today, I was informed that my friend and mentor, Yoshi K. Sasaki, died sometime this morning. Many younger people at the OU School of Meteorology (OU-SoM) have little idea what a great meteorologist and person he was and how influential he has been. He certainly was the advisor for the majority of doctoral students graduating from the OU-SoM during his active tenure there. 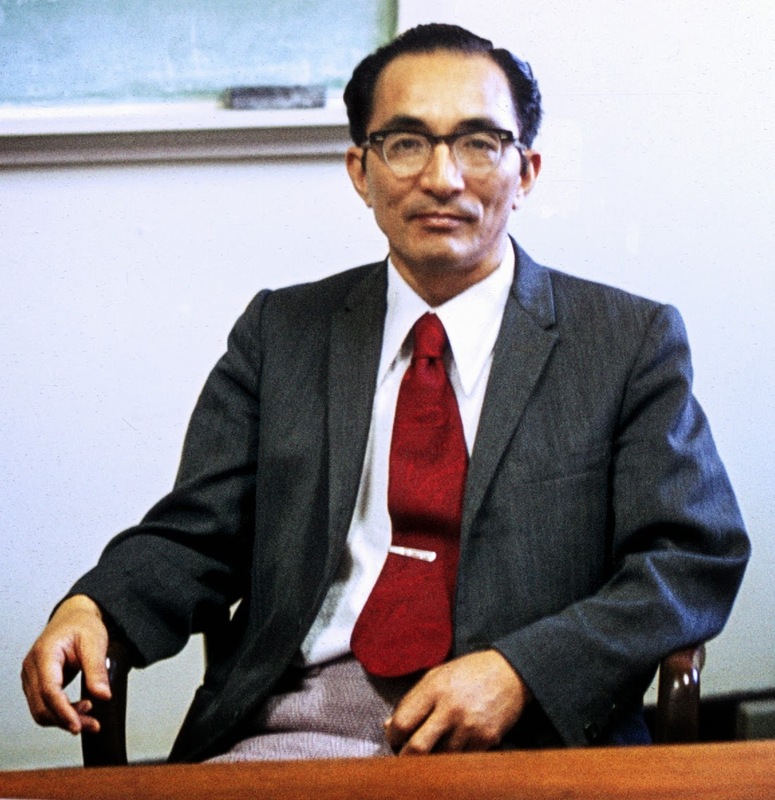 He won many OU and international awards for his work, including promoting US-Japan business collaboration, bringing Japanese companies to Norman. He helped Walt Saucier found the Department of Meteorology when he came to OU with Walt from Texas A&M in the late 1950s. I did an earlier tribute to Yoshi when he was still alive. My first interactions with him were during my first days at OU as a beginning grad student in 1967. In a stroke of stupendous good fortune, I was "assigned" to his care as my advisor. I didn't know him at all, then. Yet, shortly after I arrived, Dr. Ed Kessler (then Director of the National Severe Storms Laboratory [NSSL]) called Yoshi while I was in his office, and I heard Yoshi describing me to Dr. Kessler in glowing terms as an outstanding student! That left me flabbergasted and determined that I would do whatever it took never to let him down. He clearly had more confidence in me than I had in myself at the time. This was at a time before Yoshi became famed for his work with variational data assimilation. He had the time to be a great advisor and to do some excellent work as a classroom teacher. It was in his graduate dynamics class that I began to gain some inkling of what the atmosphere was all about. What soaring excitement there was in his classes, where putting in extra effort paid big dividends in terms of understanding. It was clear that between us was a considerable cultural divide, but I never felt that it damaged our interactions. He slapped me down when I was cocky, and he picked up my spirits when I felt overwhelmed and beaten down by the challenges. In fact, he challenged me more than anyone to become what I wanted so much to be. He looked at my lousy math grades when I first came to grad school and announced that I would minor in mathematics! By colossal good luck, I took courses from some great math teachers as a result, flushing my math phobia down the toilet and replacing it with huge enthusiasm for a subject that had been so brutal for me. He recommended I take rigorous courses in fluid dynamics from the School of Engineering, which again put me in classes with some outstanding teachers. As a result of this, I went from being a so-so student to the point where I was "setting the curve" in most of my courses. Following my sabbatical in the military, I returned to my graduate studies more determined to complete my doctorate than ever and, although Yoshi was now much busier than he had been owing to his rising fame, I was ready to become more independent - something Yoshi let happen. He supported me with his grants as I flopped and floundered, trying to figure out a topic for my dissertation research. When he went on a sabbatical to Monterey in 1974, he told me either I had to find a new advisor or find a way to support myself. In no way did I want anyone else's signature on my dissertation, so I found employment at NSSL. That turned out to be the change of venue I needed, and I eventually found my topic and completed my doctorate, with his signature on it!! All that I have accomplished is in no small measure a tribute to this wonderful man, who did just whatever I needed, when I needed it. He was a master at giving me just the help I required and not a bit more. I graduated with a clear vision of what I wanted to do and how to do it. That's worth considerably more than a piece of paper!! I could go on and on about his accomplishments, and the friendship he has offered to me after graduation. I'm reminded today of his comments to me at the time when his university mentor, the late Shigekata Syono (who was also the advisor of the late T. Theodore Fujita) had died: he told me that Syono told him the best way to thank your advisor for what he did for you was to become successful in your field, and to pass on what you have learned to others. Yoshi was trying to honor that advice, and I've tried to honor it, as well. It was so typical of him to have deep human insight as well as a great intellect - no cultural barrier could inhibit that! As we mourn the loss of this honored individual, we can take solace that he's left behind a huge legacy: I can mention a few names of his doctoral students from around the time when I was a student - Dr. E. W. (Joe) Friday [a National Weather Service Director], Dr. Robert Sheets [a Hurricane Center Director], Dr. Stanley L. Barnes [NOAA research scientist], Dr. Jerome P. Charba [NWS research scientist], Dr. John McGinley [NOAA research scientist], Dr. John M. Lewis [NOAA research scientist], and many others. Obviously, this list leaves out many who were influenced by Yoshi, including many of my storm chase friends (e.g., Al Moller). He will not be forgotten and can never be replaced. We will miss him, but are proud to have been a part of his legacy. My deepest condolences to Koko, his wife, and sons Larry, James, and Okko, and daughter Anna.